The wife and I took a little time Monday afternoon to fire up "The Knuckledragger." The oil pressure problem seems to be completely cured by the addition of a small oil tank that I made for it last week. We are also getting the starting drill worked out. Reminds me of the good old days with just Jane and I doing the prep and start up without any outside help (not that we didn't have some great guys helping us at various times during our racing career). One kind of cool feature that Neil, owner of American Thunder next door to my shop, put in is a "burn out pit." The idea was to add some entertainment during special events, but it turns out it is a pretty safe alternative for doing a little "break in" run on a drag bike. The following video (Jane's first try at video with her digital camera) shows the Knuckledragger on its second time off the rollers. After the previous start up, I leaned the carbs out a bunch, but it is still way rich in the video. From here it is time to jump back to present day technology and get the Knuckledragger onto a dyno, which will shorten up the tuning process considerably, saving a load of wear and tear on the motor. Grace is a term that most of us are familiar with. So familiar, in fact, that we may tend to hear and use the word without considering it. So what exactly is this grace that we hear so much about in Churches? The first thing I would like to note is that if you were to go to an old dictionary, such as Noah Webster's 1828 American Dictionary of the English Language, you find that the noun Grace has 20 different meanings listed, each with similarities, and yet subtle differences. The first meaning given is "Favor; good will; kindness.... I believe this gives us a good overarching feel for the meaning of the word grace. Interestingly, the second meaning listed by Webster is "The free unmerited love and favor of God." The third meaning; "Favorable influence of God." The fourth; "The application of Christ's righteousness to the sinner." The fifth; "A state of reconciliation to God." In fact, Webster gets all the way down to the tenth meaning before he leaves religion and goes on to the secular. It really makes one appreciate a man such a Noah Webster. It is said that he considered education useless without the Bible, but cautioned against too extensive use of the Bible in the schools as "tending to irreverence." What a long way we have fallen! The New Testament Greek word which is translated grace is Charis. This word is found more than 150 times in the New Testament. I am not a student of the Greek language, but from what I can ascertain from concordances and lexicons and commentaries, the multiple meanings of the English word grace are simply mirrored images of the multiple meanings of the Greek word. Now, all of that being said, let's look at some examples of verses which contain the word grace, and see if we can tell which nuance of the word fits best. James 1:11 "For the sun is no sooner risen with a burning heat, but it withereth the grass, and the flower thereof falleth, and the grace of the fashion of it perisheth: so also shall the rich man fade away in his ways." Here the word grace is used with a non religious meaning, representing the beauty or excellence of the flower. Philippians 1:7 "Even as it is meet for me to think this of you all, because I have you in my heart; inasmuch as both in my bonds, and in the defence and confirmation of the gospel, ye all are partakers of my grace." This is the apostle Paul writing. He speaks of his grace, which leads to the conclusion that grace here is being used simply to mean favor, or good will. None of the other meanings make any sense. 2 Timothy 1:9 "Who hath saved us, and called us with an holy calling, not according to our works, but according to his own purpose and grace, which was given us in Christ Jesus before the world began," If the grace mentioned in this verse was given before the world began, then surely it has to be the grace that is the free unmerited love and favor of God. We simply cannot have earned God's favor before we existed. So let's try it this way: Who hath saved us, and called us with an holy calling, not according to our works, but according to his own purpose and free unmerited love and favor, which was given us in Christ Jesus before the world began. Romans 3:24 "Being justified freely by his grace through the redemption that is in Christ Jesus:" Our first meaning, Favor/good will/kindness seems to fit. Being justified freely by his favor through the redemption that is in Christ Jesus. The second also fits. Being justified freely by his free unmerited love and favor through the redemption that is in Christ Jesus. How about this: Being justified freely by his application of Christ's righteousness through the redemption that is in Christ Jesus. Here we have the meaning that fits best. When we see the term justified, we need to think "justice." In order for God's justice to be satisfied, someone needed to pay the penalty. At the cross, a great exchange was made. Christ took our sins upon himself, paid our penalty, and we were given credit for his righteousness. Romans 6:14 "For sin shall not have dominion over you: for ye are not under the law, but under grace." Here we come to Webster's fifth meaning: A state of reconciliation to God. Let's try that. For sin shall not have dominion over you: for ye are not under the law, but under a state of reconciliation to God. Ephesians 2:4-10 "But God, who is rich in mercy, for his great love wherewith he loved us, Even when we were dead in sins, hath quickened us together with Christ, (by grace ye are saved;) And hath raised us up together, and made us sit together in heavenly places in Christ Jesus: That in the ages to come he might shew the exceeding riches of his grace in his kindness toward us through Christ Jesus. For by grace are ye saved through faith; and that not of yourselves: it is the gift of God: Not of works, lest any man should boast. For we are his workmanship, created in Christ Jesus unto good works, which God hath before ordained that we should walk in them." In this passage, the word grace is used three times. Let's look at the second one first. It says that God will show the exceeding riches of his grace in his kindness toward us through Christ Jesus. I think we can safely read this as God will show the exceeding riches of his favor in his kindness toward us through Christ Jesus. Both of the other two uses of the word grace in this passage are nearly identical. By grace ye are saved, and For by grace are ye saved through faith. If, as the Bible says, you are saved by grace, then it is of the utmost importance to understand which meaning, which nuance of the word grace is meant. Certainly, it is the application of Christ's righteousness to the sinner which is in view here. By the application of Christ's righteousness are ye saved. In fact it is through my faith in the application of Christ's righteousness to me the sinner; It is through your faith in the application of Christ's righteousness to you the sinner! Last fall I finished up the build on my re-creation of a 1950's drag bike, "The Knuckledragger." I did take one stab at starting the bike at that time, but my tendency towards, shall we say, frugality, foiled that attempt. I pulled the battery out of one of my cars to power the roller starter. Unfortunately a weaker than expected battery and a lot of compression conspired to "shoot" the rollers out from under the rear wheel on each attempt. Then, being the skinflint that I am, I chose to wait till spring to purchase a new battery. Two actually. After conferring with the builder of the rollers, I opted to run them on 24 volts rather than 12. 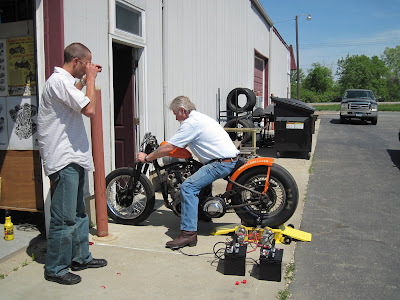 So, with a pair of 795 cold cranking amp batteries, and the help of our son Joe, it was time to see if the bike would actually run. The first glitch came soon enough. In the excitement of the moment, I forgot to rewire the solenoid on the rollers. I knew better of course, as evidenced by the fact that I realized immediately what I had done wrong when the contacts welded themselves, leaving me helplessly holding the bike up as the the rollers (and the rear wheel of the bike) spun uncontrollably. Luckily, Joe is a veteran of dragbike stuff not always behaving as planned. Without hesitation he started to unhook a battery cable. Hmm. Maybe I should have actually installed that 1/4 turn quick disconnect that I had left over from an earlier drag bike starter rather than just bringing it along. No problem, at least no problem a quick trip to the local auto parts store for a new $36 solenoid wouldn't solve. With the new solenoid AND the quick disconnect installed, we were ready for round two. Bike on the rollers, a squirt of raw gas into each carb (in case the alcohol doesn't want to light), high gear, rear wheel spinning, dump the clutch, engine spinning, and.... nothing! Now what? Not even a pop or backfire. Must not have spark. We pull the plugs and ground them so we can check for spark. Fire up the rollers again, and sure enough, no spark. And its a new magneto! Wait, could I have wired the kill switch backward? With the engine still turning over, I flip the switch back and forth, and low and behold we get spark. Better check that switch with an ohm meter; I can't believe I wired it backward! Well.... no. Its wired correctly, but it is intermittent. One time you flip it, and it makes contact, the next time it doesn't. Not a very good situation for a supposed safety feature! For now we'll just disconnect the switch from the mag and substitute a blade from a feeler gauge to work as a shut off switch. Besides, we have the front wheel against the building to prevent any really serious surprises. So, we go through the whole drill again. Bike on the rollers, high gear, rear wheel spinning, dump the clutch, engine spinning, and.... it lives! And not half bad at that. I fully expected to have to do some adjusting on the low speed in order to even get the bike to idle, but I was wrong. It idled and took throttle just fine. But The Knuckledragger had one more monkey wrench to throw at us. No oil pressure. This was not a total surprise. I had my doubts about the ability of the tiny little pre 1940 pump to pull oil uphill from the trans case, especially at the odd angle it was situated in the VL frame. In fact that is the reason I had a pressure gauge temporarily mounted. Despite a couple attempts at priming the pump, it looks like a separate oil tank is going to be in order. I left a tab on the back side of the seat post for just such a situation. All in all, I have to admit I am quite pleased. It was fun to monkey around on a drag bike with Joe again (he started drag racing at the age of 15, if memory serves). And best of all, The Knuckledragger runs! One of the blogs that I follow had a post today which reminded me of something that struck me during the preaching at my Church this past Sunday. I had planned a short post about this "Eureka" moment, but had not found the time yet. The post I read contained an illustration that likely many of you have heard before; I certainly had. It speaks of how a baby is all cute and cuddly and lovable and basically helpless. But then it goes on to say how that same baby, if he grows older, but never matures, is no longer so cute and cuddly. If he were to reach the age of, say 21, and still cannot provide for himself, cannot clean up after himself, and is still just as helpless as when a baby, and this is all by his own choice, then one might be tempted to call him some sort of monster. The analogy is that of the "Christian" who never grows up. Still no spiritual growth after 5, 10, 25 years of having a testimony of salvation. Never even read the Bible all the way through. This was what brought to mind last Sunday's sermon. I don't recall now exactly what the statement was that my pastor made. But I do remember that what he said immediately brought to mind a verse of scripture. And I had the feeling that he was alluding to that verse without stating it specifically. I even remember thinking that if I had been preaching, I would have felt compelled to either read or point out the verse, because if someone was not familiar with the Bible, they would not get the connection; not get the full meaning. Then it hit me. If you are not thoroughly familiar with the Bible, you are missing a big chunk of every sermon you might hear. I don't think I am taking this verse out of context by taking this from it: it is the Holy Spirit that brings to our memory scriptures when needed. The problem is, you cannot remember what you do not know. So, if you call yourself a Christian, isn't it about time that you grow up? You have no idea of all that you are missing.